How a woman whose muscles disappeared discovered she shared a disease with a muscle-bound Olympic medalist. by David Epstein, ProPublica January 15, 2016 This story was updated on January 17, 2016. This story was co-produced with This American Life. Since this story was published there has been a flurry of interest in Jill Viles’ condition. Read more about what has happened. This American Life will also be re-running its version of her story on its podcast at 8 p.m. Eastern Time on Jan. 15, 2017. Two years ago, I wrote a book called “The Sports Gene” that examines the intersection of genetics and athleticism. I expected my mother to buy a dozen copies and invite me to her book club and that would be the end of it. (She did.) Instead, I was almost immediately bombarded with emails from people wanting to know if their kid has Serena Williams’ genes. One coach emailed, wondering how one would get athletes involved in genetic experimentation. They were coming so quickly, and many were so unhinged, that I took a brief break from opening them. Hear the This American Life story on radio stations around the country this week, or download it as a podcast. And then I got one that had this subject heading: “Olympic medalist and muscular dystrophy patient with the same mutation.” Now that caught my attention. I wondered if it might point me to some article or paper in a genetics journal about an elite athlete I’d somehow missed. Instead, it was a personal note from a 39-year-old Iowa mother named Jill Viles. 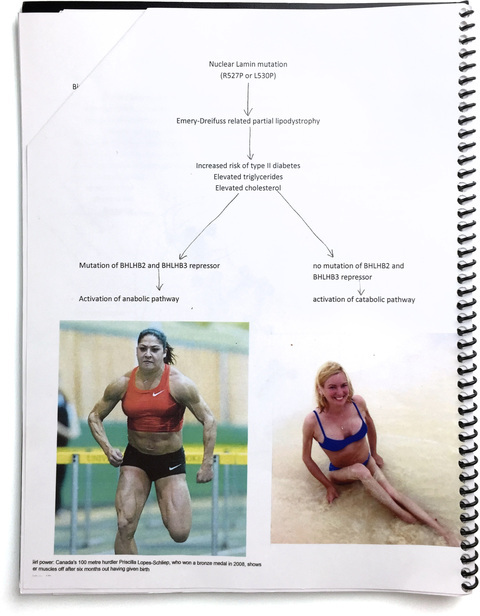 She was the muscular dystrophy patient, and she had an elaborate theory linking the gene mutation that made her muscles wither to an Olympic sprinter named Priscilla Lopes-Schliep. She offered to send me more info if I was interested. Sure, I told her, send more. A few days later, I got a package from Jill, and it was… how to put it?… quite a bit more elaborate than I had anticipated. It included a stack of family photos — the originals, not copies; a detailed medical history; scientific papers, and a 19-page, illustrated and bound packet. I flipped through the packet, and at first it seemed a little strange. Not ransom-note strange, but there were hand-drawn diagrams with cutouts of little cartoon weightlifters representing protein molecules. Jill had clearly put a lot of effort into this, so I felt like I had to at least read it. Within a few minutes, I was astounded. This woman knew some serious science. She off-handedly noted that certain hormones, like insulin, were too large to enter our cells directly; she referred to gene mutations by their specific DNA addresses, the way a scientist would. And then I came to page 14. There were two photos, side-by-side. One was of Jill, in a royal blue bikini, sitting at the beach. Her torso looks completely normal. But her arms are spindles. They almost couldn’t be skinnier, like the sticks jabbed into a snowman for arms. And her legs are so thin that her knee joint is as wide as her thigh. Those legs can’t possibly hold her, I thought. The other picture was of Priscilla Lopes-Schliep. Priscilla is one of the best sprinters in Canadian history. At the 2008 Olympics in Beijing, she won the bronze medal in the 100-meter hurdles. It was the first Canadian Olympic medal in track and field since 1996. In 2010, Priscilla was the best 100-meter hurdler in the world. The photo of her beside Jill is remarkable. Priscilla is in mid-stride. It’s difficult to describe just how muscular she looks. She’s like the vision of a superhero that a third-grader might draw. Oblong muscles are bursting from her thighs. Ropey veins snake along her biceps. This is the woman Jill thought she shared a mutant gene with? I think I laughed looking at the pictures side-by-side. Somehow, from looking at pictures of Priscilla on the internet, Jill saw something that she recognized in her own, much-smaller body, and decided Priscilla shares her rare gene mutation. And since Priscilla doesn’t have muscular dystrophy, her body must have found some way “to go around it,” as Jill put it, and make enormous muscles. If she was right, Jill thought, maybe scientists could study both of them and figure out how to help people with muscles like Jill have muscles a little more toward the Priscilla end of the human physique spectrum. Jill was sharing all this with me because she wasn’t sure how best to contact Priscilla, and hoped I would facilitate an introduction. It seemed absolutely crazy. The idea that an Iowa housewife, equipped with the cutting-edge medical tool known as Google Images, would make a medical discovery about a pro athlete who sees doctors and athletic trainers as part of her job? I consulted Harvard geneticist Robert C. Green to get his thoughts, in part because he has done important work on how people react to receiving information about their genes. Green was open to discussing it, but he recalls a justifiable concern that had nothing to do with science: “Empowering a relationship between these two women could end badly,” he says. “People go off the deep end when they are relating to celebrities they think they have a connection to.” I was skeptical too. Maybe she was a nutjob. I had no idea yet that Jill, just by investigating her own family, had learned more about the manifestations of her disease than nearly anyone in the world, and that she could see things that no one else could. Jill was born in 1974, and she met all the normal baby milestones — sitting, crawling, and walking right on time. She was tiny, though. Not short, just slight. She was so skinny as a three-year-old that she once fell into a toilet bowl, her feet sticking over her head. The stumbling didn’t start until she was four. Jill’s dad remembered having some trouble walking as a kid, and his doctors told him he’d had a very mild case of polio. But Jill’s symptoms were much more pronounced, and her pediatrician was stumped. He told the family to go to the Mayo Clinic. They were stumped there, too. They tested the entire family, and saw that Jill, her father and her brother had higher than normal levels of creatine kinase in their blood. That is an enzyme that leaks out of muscles when they are damaged, but Jill was the only one struggling to walk. Based on the creatine kinase, the doctors thought the family might have some form of muscular dystrophy, but that didn’t usually show up this way in little girls, and why did Jill’s father and brother seem fine? Jill returned to the Mayo Clinic every summer, and it was always the same. There was nothing doctors could do, and nothing new they could tell her. The constant falling-on-her-face stopped on its own, but it was replaced by a burning sensation in her legs. And while Jill was growing in height like a normal girl, the fat on her arms and legs was vanishing. 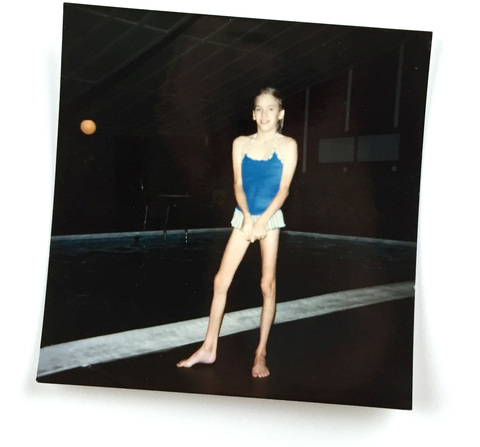 By the time she was eight, her arms and legs were so skinny that other kids would wrap their fingers around them and ask if her mother fed her at home. By 12, veins were starting to pop out of her legs, and the other kids started asking how it felt to be old. She was rail thin, but she could still do most of the things normal kids did. A video of her 12th birthday shows Jill at a pool party, her cannonball displacing a teacup of water. Later that year, her muscles started to fail again. “I can remember just getting on a bike I’d always ridden,” Jill says, “and feeling like someone came up behind me and just threw me into the handlebars.” Suddenly she couldn’t hold her upper body up over the bike. She invited a friend to go roller skating, and found that she couldn’t stand up on the skates. Over the course of a few weeks, Jill had completely lost the ability to ride a bike and skate. By the time she left for college, Jill had maxed out at 5-foot-3 and 87 pounds. She had long since moved on from poltergeists, but not from the knowledge that if she was going to figure out what was happening to her body, she would have to go it alone. Jill’s dad was thin, but the muscles in his forearm and hand were unusually well-defined. Jill would call it a “Popeye arm” when she was a little girl. In another paper she saw that Emery-Dreifuss patients often had that same trait; it was even referred to as a Popeye arm deformity. But she didn’t see pictures of women with the disease. The Muscle and Nerve paper described the three hallmarks of Emery-Dreifuss patients: They couldn’t touch their chins to their chests, or their heels to the floor, and their arms were perpetually bent at the elbow. The medical term is “contractures.” In middle school, Jill’s head once got stuck for a while so that she was looking up. 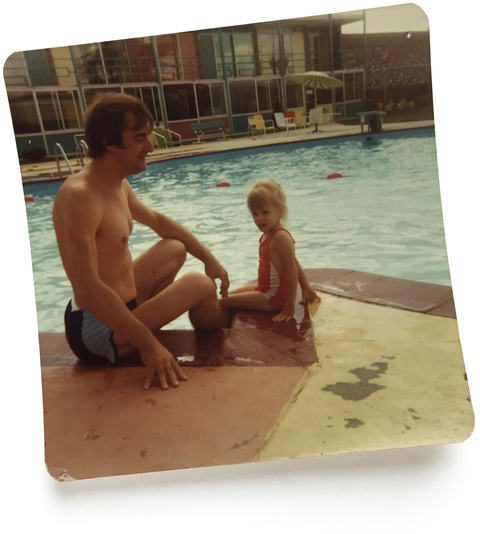 Jill at the pool with her father, who had many of her same symptoms, though not as severe. Jill was positive that this is what she had. So she read on, and got scared. The papers noted that Emery-Dreifuss always comes with heart trouble. She had to read more, so before going home for college break she stuffed her bag full of medical books and papers. She didn’t want to scare anyone in the family, so she didn’t read the papers openly. But one day during break, she went to the kitchen to microwave popcorn and returned to find her father perusing the stack of material from her bag. He told her he had all the symptoms she was reading about. “Well, yeah, I know…the arm, and the neck,” Jill told him. No, he replied, all the cardiac symptoms. Doctors had told Jill’s father years earlier that his irregular heart rhythms had been due to some kind of virus. “It’s not,” Jill told him. “We have Emery-Dreifuss.” She went to the Iowa Heart Center with her Emery-Dreifuss papers and started insisting that a cardiologist needed to see her father. At first, nurses told her she’d need a referral. But Jill had trouble getting one and was so relentless that eventually they gave in. The cardiologist put a Holter monitor on Jill’s dad, which tracked his heart’s electrical activity for a day. At one point, his pulse rate dropped into the 20s, which meant he was either about to win the Tour de France, or he might be about to drop dead. He was 45, and had a pacemaker put in immediately. Even after the pacemaker surgery, the Iowa Heart Center couldn’t confirm that Emery-Dreifuss ran in Jill’s family. She had, though, in her reading, come across a group of researchers in Italy who were looking for families with Emery-Dreifuss to study, hoping to locate a gene mutation that causes the disease. So 19-year-old Jill put on her most serious navy pantsuit, again gathered up her papers, and took them to a neurologist in Des Moines. She asked the neurologist to take a look, hoping that she would help her connect with the Italian team and get in the study. But the neurologist would have none of it. “No, you don’t have that,” Jill recalls the neurologist saying sternly. And then she refused even to look at the papers. It might seem rude that a doctor refused just to hear Jill out and glance at the papers, but, at the time, most doctors believed Emery-Dreifuss only occurred in men. Plus, this was a self-diagnosis of an obscure disease coming from a teenager. Up to that point, the Italians had only collected four other families to study, so they were thrilled to hear from Jill, and immediately wrote back. From the letter, it seems as though the Italian team thought Jill had access to a lab. Can you send DNA from your entire family? it reads. “If you cannot prepare DNA, just send fresh blood.” And then it gave mailing instructions. Discouraged by her encounter with the neurologist, Jill figured it would be a dead end to show up at a hospital and ask that her blood be drawn so she could ship it to Italy. So she convinced a nurse friend to smuggle needles and test tubes to her house. They filled them with her family’s blood. At the post office, when Jill declared that her packages contained blood, an employee had to retrieve a big binder that listed what can be shipped to various countries. Fortunately, Italy took blood in the mail. Today, an entire human genome can be sequenced in a few days. But in the mid-1990s sequencing was a ponderous ordeal. It would be four years before Jill heard back from the Italians. In the years after she sent her family’s blood overseas, Jill waited for confirmation that she had Emery-Dreifuss. Sort of. She was so confident that in her annual trips to the Mayo Clinic, she started taking a pen from her purse and writing “Emery-Dreifuss” on her medical chart. Her mom would get upset: “You cannot change your chart!” I want what I actually have to be listed, Jill would tell her. Then in 1999, Jill got an email from Italy. She stopped before opening it to let the moment sink in. And then she clicked. She had a mutation on a gene known as LMNA, or, for ease: the lamin gene. So did her father, two brothers, and a sister. So did the other four families in the study with Emery-Dreifuss. Jill’s lamin gene has a typo in it, a serious one. We all have little genome typos, or mutations, hundreds of them. “Mutation” is simply the term for a version of a gene that fewer than 2 percent of the population has. But most of them don’t do anything. Along the spiraling ladders of her DNA, the 3 billion G’s, T’s, A’s and C’s in Jill’s genome, the single-letter typo on her lamin gene just happened to be in a very unfortunate place. To appreciate the scale of what happened to Jill, imagine enough letters to fill 13 complete sets of Encyclopaedia Britannica with a single-letter typo that changes the meaning of a crucial entry. Jill was 25, and a lab director at Johns Hopkins University had heard through the medical grapevine about the young woman who diagnosed her own Emery-Dreifuss. Wanting both a dogged intern and — why not? — a real-life lamin mutant in her lab, the scientist offered Jill a summer internship. Jill’s job was to sift through scientific journals and find any references to diseases that might be caused by a lamin mutation. Sitting there day after day, reading, as she had freshman year in college in the library, Jill came across an incredibly rare disease. A disorder called partial lipodystrophy. It caused fat on certain parts of the body, particularly the limbs, to disappear, leaving veins and muscles to stand out, as if they’d been shrink-wrapped in skin. 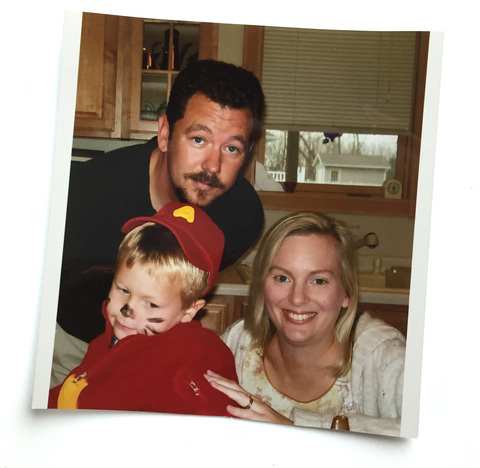 Looking at photos of patients with partial lipodystrophy, all Jill could think was that they looked like her family members. Could Jill have not just one, but two incredibly rare genetic diseases? The odds of having Jill’s Emery-Dreifuss were so rare that the prevalence isn’t even known; certainly more rare than one in a million. The odds of having partial lipodystrophy are probably somewhere between one in one million and one in 15 million. The odds of separately getting both by chance alone? It was one in far more than the number of people who have lived on Earth, ever. So she stopped reading scientific literature. Cold turkey. No more medical research. No more DIY diagnosis. She started working as a writing instructor at community colleges, and taught adult education at night. She started dating, and met Jeremy, the man she would marry. And though there was a 50-50 chance she would pass down her Emery-Dreifuss gene mutation, they decided to have a child. Jill’s pregnancy was normal, and her son Martin did not inherit the mutation. But after he was born, Jill’s physical problems accelerated. By Martin’s first birthday, she could hardly walk. One day, he was calling that he wanted mac and cheese. It was just a few feet to the kitchen. “I had six steps to take,” Jill says, “and I realized this is it. This is the last six steps I’m going to take.” After that, Jill could not get up again. Five years later, Jill’s father told Jill’s mother that he was tired, so he moved from his scooter to his favorite chair. He bowed his head, as if taking a nap, but he never woke up. His heart had finally failed at the age of 63. Jill and her husband Jeremy and son, Martin. 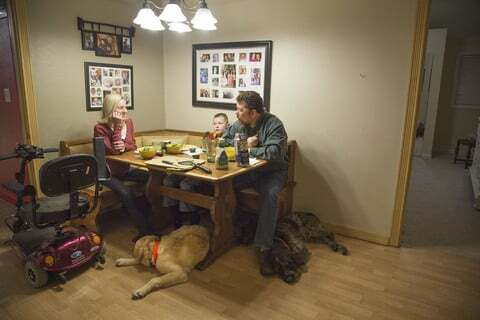 On the day her dad passed away, Jill and her siblings and a few relatives had dinner together at her mom’s house. Later that week, Jill’s younger sister Betsy pulled Jill over to the computer to show her a picture. People often asked Betsy what kind of workout she did, because the muscles in her arms were so well defined. But it wasn’t from the gym. Betsy’s arms had always been defined, and as she grew up, she wanted to know why. Jill told her she might want to look into lipodystrophy, but that doctors had told her years ago that she didn’t have it. Betsy attended a meeting for people with lipodystrophy, and there learned about an Olympic sprinter who was conspicuously missing fat. The picture Betsy showed Jill was, of course, Priscilla Lopes-Schliep. It was the third time Jill had made a visual lock on something rare. First, it was with her family’s Emery-Dreifuss, then when she thought they had lipodystrophy, and now she thought that she and Priscilla just must have a mutant gene in common because of the exact same pattern of missing fat. But how, then, did Priscilla get a double-helping of muscle while Jill’s muscles were scarcely there? If this sounds familiar, it might be because it’s basically the plot of the Bruce Willis and Samuel L. Jackson movie “Unbreakable,” about comic book superheros. Jackson plays a broken-boned, physically fragile man, searching for his genetic opposite, a man born so strong he can survive any physical trauma. In the final scene, Jackson tells Willis he’s the guy. Jill’s 12-year abstinence from medical literature was over; she wanted to enlist Priscilla in her genetic detective work. Partly out of curiosity, but also because if Priscilla’s body had indeed found some way to “go around” a lamin mutation that should cause muscle failure, it could be important for scientific research. A full year passed. That’s when I came in. Jill happened to be in earshot of her television when I started yammering about athletes and genetics on Good Morning America. “I thought, oh, this is divine providence. This is exactly what I’m looking for,” Jill says. 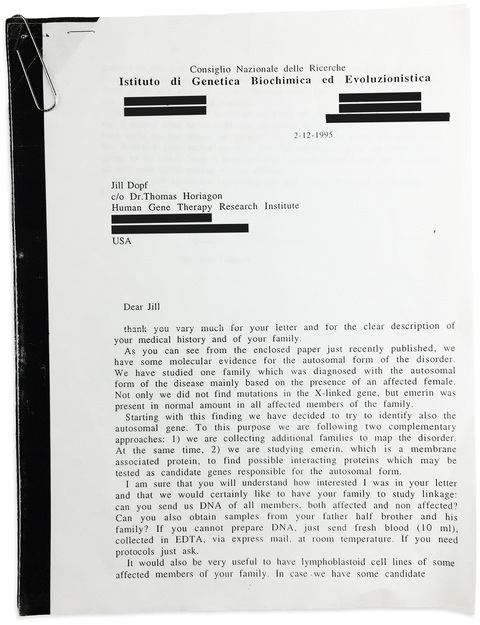 So she sent me an e-mail, and then the package, with original family photos, scientific papers, and the 19-page-bound packet explaining her gene mutation and her theory that Priscilla also had a lamin mutation. Jill wanted my help getting in touch with Priscilla. It just so happened that Priscilla’s agent and I followed one another on Twitter. So I sent him a direct message. I didn’t expect anything to come of it. I mean, I was telling a pro athlete that a stranger in Iowa wanted to talk to her about getting a genetic test. Luckily, Kris Mychasiw, Priscilla’s agent, is an extraordinarily nice guy. And he also knew that Priscilla constantly faced steroid whispers because of her musculature. After she won the Olympic bronze in 2008, some media in Europe began to openly accuse her. She ran at one meet in France specifically so that she could address the French media. Kris passed on my request to Priscilla. “He was just like, ‘This lady in Iowa. She says she has the same gene as you, and wants to have a conversation,’” Priscilla recalls. “I was kind of like, “Um, I don’t know Kris.’” But he told her just to have the conversation, and see where it goes. I talked to Priscilla first, and then she and Jill talked on the phone. Jill sent Priscilla the same 19-page packet she’d sent me. And it wasn’t any of the abstruse science that caught Priscilla, it was the childhood stories Jill shared about kids pointing at the veins in her legs. As a little girl, Priscilla would come home asking her parents to get the veins removed from her legs because the boys were making fun of her. One of Priscilla’s cousins had looked into lipodystrophy, but nobody in the family had ever gotten a firm diagnosis, nor did they know much about the condition. They just knew there were a lot of strong and well-defined people in the family, especially the women. But there wasn’t much impetus to do a deep investigation. After all, when Priscilla was a kid she wasn’t falling like Jill, she was getting strong, and fast. She earned a track scholarship to Nebraska, where she became one of the best athletes in the university’s history and won a national championship. After college she turned professional, and won her Olympic medal. Priscilla thinks that because of her physique, she was targeted for more than the normal amount of drug testing. (Targeted testing is a standard part of anti-doping.) She was tested right after having her daughter, Natalia. At the World Championships in Berlin in 2009, she was tested just minutes before winning a silver medal. There’s not even supposed to be any drug testing that close to the race. The following month, at a meet in Greece, someone stole her training journal out of her bag. It was at the very bottom, underneath expensive workout clothes and shoes, none of which were taken. Why steal a training journal? We’ll never know. But I’ve covered a lot of doping stories, and I’m convinced someone thought the journal contained her steroid regimen. Jill and Priscilla spoke on the phone several times. Then, eight months after I introduced them, they agreed to meet in person. They picked a hotel lobby in Toronto, where Priscilla lived. Jill arrived first, with her mom. Jill offered Priscilla a cashier’s check, money that had been raised for research in a memorial fund after her father’s death. Jill hoped Priscilla would take it and use it to pay for a genetic test. And Priscilla agreed. It took a year to find a doctor to test Priscilla. She visited several clinics. Some told her they just didn’t do that test. Others said they weren’t sure how to interpret the results, so they felt it wouldn’t be responsible to do the test. Finally, Jill went to a medical conference and approached the foremost expert in lipodystrophy, Dr. Abhimanyu Garg, who runs a lab at the University of Texas Southwestern Medical Center. He agreed to do both genetic testing and a lipodystrophy evaluation. The results showed that Jill had been right. She and Priscilla do have a genetic connection. Not only do she and Priscilla both have lipodystrophy — the disease Jill had been told to cast aside back when she was an intern at Johns Hopkins — but they have the exact same subcategory of partial lipodystrophy, known as Dunnigan-type. Priscilla has now overhauled her diet and started medication. She was recently recruited to try bobsled for Canada, which — if all goes well — could give her a chance to be the sixth athlete ever to win a medal in both the Summer and Winter Olympics. And, with her genetic test, she hopes the steroid whispers will die down too. A little more than a decade ago, when the first full human genome was sequenced, some medical futurists and optimistic doctors prophesied that we’d all bring our genetic information to the doctor’s office to get treatment personalized to our DNA. Not only has that not materialized, but, for the most part, studies that scan entire genomes for disease-causing DNA “have not resulted in anything clinically useful,” says Heidi Rehm, a geneticist at the Harvard Medical School. It’s not that there aren’t plenty of genes that matter, but it turns out that unraveling genetic causes of disease is a whole lot more complicated than that wishful thinking of a decade ago. Rather than single genes causing a disease — or any trait, really — it’s usually many small genes, each with a tiny effect, combining to influence a condition, and doing so in concert with lifestyle and other environmental factors. A website to help scientists find people with related rare diseases. The hope is that scientists can find and study more people like Jill and Priscilla. Learn more. For example, research on a rare gene mutation, which gave people such low cholesterol levels it was a wonder they were alive, led to a treatment for high cholesterol. An Alzheimer’s treatment may one day come from ongoing research on a small group of people in Iceland who have a version of a gene that protects their brains in old age. Recently, Rehm and a group of scientists started something called the Matchmaker Exchange, it’s a kind of OkCupid for rare diseases, where people with uncommon conditions can be matched with other people with similar diseases and gene mutations, in the hope that it will spark new discoveries. After all, under normal circumstances, Jill and Priscilla never would have ended up in the same doctor’s office. A person with a rare disease in their family will often have seen more cases and different manifestations of the disease than any doctor has. Dr. Garg, who has studied lipodystrophy for 30 years, says that Jill and Priscilla are the most extreme cases of muscle development he has ever seen in lipodystrophy patients — on opposite ends of the spectrum, of course. What might be causing that? Jill and Priscilla don’t have the exact same typo, or “point mutation.” Because of that, they have one condition precisely in common — Dunnigan-type partial lipodystrophy — and another that is divergent as can be — their muscles. But the mechanism behind their difference is an important mystery. It might not surprise you by now that, in search of an answer, Jill hit the scientific journals. She alighted on the work of a French molecular biologist named Etienne Lefai. He does extremely technical work on a protein with the less than mellifluous name: SREBP1. SREBP1 has long been known to manage fat storage. After a meal, SREBP1 is helping each of your cells decide whether to use the fat that just arrived for fuel or store it for later. Lefai’s team found, in animals, that a buildup of SREBP1 in the cell can lead either to extreme muscle atrophy or extreme muscle growth. And that was something Jill was interested in. She sent Lefai a two-line email with a question about his work. He thought it was from a scientist or Ph.D. student and responded. Soon, Jill told Lefai about her own history, and suggested that it is possible that he discovered the actual biological mechanism that makes her and Priscilla so different — SREBP1 interacting with lamin. Since Jill first contacted him, he has learned that lamin proteins — which the body creates using instructions from the lamin gene — can interact with SREBP1. Now Lefai is working to figure out whether a lamin gene mutation alters the ability of lamin proteins to regulate how SREBP1 works, causing simultaneous loss of muscle and fat. It’s possible, though certainly not assured, that his work could ultimately lead to new treatments. It is the dream of many rare disease patients to have a scientist orient his research agenda around them. The first time Jill and I spoke, she told me that she knew there would be no treatment breakthrough in her lifetime. (Although, I’m not so sure.) But she doesn’t want what she learned to be lost, and hopes that maybe she’ll have made a small contribution to some therapy that’s developed for some other generation. She told me recently that she has proved her point, and she’s thrilled that she was able to help Priscilla improve her own health. The two women have stayed in touch. They talk about their kids. Priscilla is quite sure her daughters got her mutation. She can feel the difference between other kids and her own when she lifts them. Her girls are dense, with solid muscles. In my years of reporting on genetics and athleticism, I only know of two other cases where rare versions of single genes were associated with elite athletic performance, and the other two debuted in medical journals. Still, Jill told me that she’s officially retiring, for good this time, from DIY diagnosis. She gave me the same line that athletes so often wield when they hang ‘em up: I want to spend more time with my family. Her mother, Mary, says it would be great if Jill could move on and just focus on the rest of her life. But do you think she’ll really retire? I asked. “Probably not,” Mary told me. It’s been two-and-a-half years since Jill happened to hear me on television and decided to reach out. Before Priscilla agreed to get a genetic test, I hadn’t really thought of all this as a story I would one day write. I just thought Jill deserved a response. But I don’t believe she’s retiring either. Update, Jan. 13, 2017: Prior to the publication of this story, Jill's biggest concern was that she would face public criticism for her decision to have a child despite being aware of her hereditary disease. (Her son, Martin, does not have lipodystrophy or Emery-Dreifuss muscular dystrophy.) Fortunately, those fears went unrealized. “A lot of great things have happened,” Jill says, since the story ran. She has been invited to talk about her life and medical conditions in the U.S. and around the world, from the Federal Reserve Bank of Chicago to a medical conference in Bologna, Italy. Shortly after the story ran, biotech companies in the U.S. and the U.K. contacted Jill with offers to study huge portions of her genome for free, and to do the same for her affected family members, as well as for Priscilla. Jill took up one of those offers, and soon has an initial conference call with Congenica. “While they don't believe they've found a smoking gun,” Jill says, “they have identified two potential genes of interest” that may help explain why family members with the same disease can be so differently impacted. No matter the outcome, Jill is excited at the sudden interest in studying her family's condition. Jill's “biggest fan,” she says, turned out to be actress Allison Williams. “She's expressed interest in portraying me in a film based on the life stories of me and Priscilla,” Jill says. She and Priscilla — who retired from her career as a professional athlete months after the story — have kept in touch, and even exchanged Christmas gifts. Update, Jan. 17, 2016: This story has been updated to reflect that Betsy, Jill’s sister, remembers telling her about Priscilla in the days after their father passed away, not the same day. This update also pertains to Jill’s recollection in the accompanying video at 0:35. David Epstein covers sports science, including the use of performance-enhancing drugs. 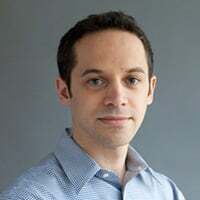 He is the author of the 2013 book “The Sports Gene: Inside the Science of Extraordinary Athletic Performance” and a former senior writer at Sports Illustrated. Sign up to get ProPublica’s investigations delivered to your inbox.